This book was not for me! I really hope KFF’s reviewer, Claire, who is indispensable to our team, comes back to us as soon as she can. Needless to say; my buddy reader, right arm and the one and only person that gives me the green light to post my reviews, suggested I try this book out. Thank you so much Rachel! What. A. Read! To start off with, I love football. Better known as soccer for you gals in the U.S. This novel literally comes alive on the football ground. The author’s ability to describe Thomas’ team’s matches is uncanny, although I would go so far as saying that I disagreed with her opinion regarding Spain robbing Germany in the World Cup in year 2000. All said and done; I live in this passionate country! Thomas is a player. His reputation is well-known with the gals where he studies. Love ‘em, leave ‘em attitude and no questions asked because he has no time or inclination to get involved. No-one knows the private hell he is having trouble coping with. This gorgeous lad comes across as a real bully but that’s far from the truth. His father’s personality overwhelms him to such a degree that he can’t say no to him and tries his hardest to calm troubled waters irrelevant of the consequences. Like father, like son? You will only find out by reading this excellent book? He is a good captain, motivates his college team, and this excellent goalie’s reputation has put him in is in the eye of one of the best soccer scouts in Europe. However, the guilt which consumes him has been sown by none other than his father; the person he wants to please more. His father is a tyrant. Verbally and physically abusive towards his son, he also uses his influences to blackmail when it suits his whim to get results regardless of anyone’s feeling. This person is a horrendously nasty piece of work and explicitly described by the author. I would have gladly jumped into the book and strangled him with my own hands! I couldn’t get over the way this egocentric man treated his son so abominably. Thomas’ father’s extreme doings revolve around how his son’s success at being the best goalkeeper is. How Thomas thinks isn’t taken into consideration, and that is the crux of this story! Nicole! Oooh, my goodness me! What an outstanding person! If Thomas has baggage, she has more! I literally fell in love with her strong character, her patience, and her stunning beauty. How can one not fall for her? Well, quite simply because not only is she hard to get, but she never conforms to Thomas’ explanations. She wants the truth without any strings attached and her compassion abounds. I really must mention her father, Sheriff Skye, too. If only our daughters had such a marvellous and comprehensive person like him to stand by us through thick and thin! Poor Thomas! There was a point in the book that had me flipping the pages really quickly. My heart bled for him so much so that I was sobbing my heart out and had to go back and try to reread without time to wipe my tears away. Furthermore, all electronic devices were disconnected since I wasn’t in the mood for interruptions! This read is quite simply heart-wrenching! What on earth can I say to the author? Exceptional doesn’t seem to be enough to a story that has a happy ending. Ms. Savage; if I could, I would have given your book more than five stars. I think BRAVO sums up this story perfectly! I would like to thank Rachel for helping me choose the quotes which wasn’t by any means easy! logy, and she brings a lot of that knowledge into the characters within her stories. 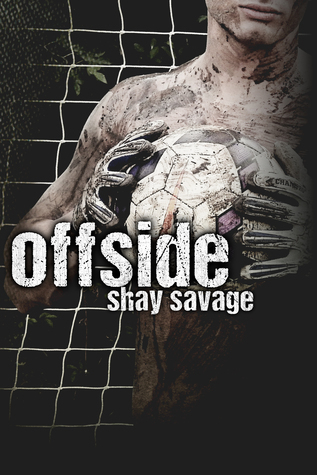 KFF LOVED THIS BOOK SO MUCH THAT WE’RE GOING TO DO A GIVEAWAY OF OFFSIDE BY SHAY SAVAGE! 1) Like our FB page if you haven’t already! 4) Tag five FB buddies! And as s always, this giveaway has nothing to do with FB!